Trains will return 45 minutes after the game ends. This special train service is made possible by support from the Mobile Source Air Pollution Reduction Review Committee. To celebrate the Angels vs. Dodgers rivalry, come meet Jay Johnstone and Bob Boone. Take photos, get their autographs, and then ride with them to the game on Metrolink. You can even win free Metrolink roundtrip tickets. Just bring a non-perishable food item donation for Second Food Harvest to spin the prize wheel for a chance to win free Metrolink tickets, Angels merchandise and other prizes. Back-to-back games without bumper-to-bumper traffic. Take the special Metrolink service to see the Angels vs. the Dodgers games at Dodgers Stadium in Los Angeles on May 27 and 28, 2013. 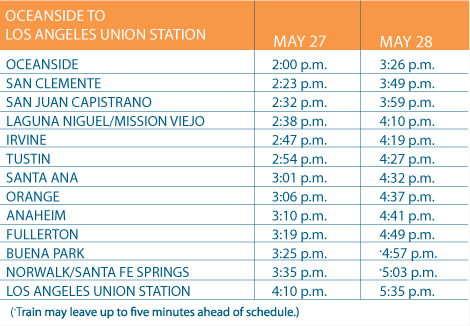 From L.A. Union Station, Metrolink riders can board Dodger Stadium Express to Dodgers Stadium and back. All for a very special price – only $7 roundtrip! Board Orange County Line train at the station nearest you. Check the schedule below. Metrolink riders can board the Dodger Stadium Express at Bay 3 of the Patsaouras Transit Plaza at L.A. Union Station. Dodger Stadium Express leaves L.A. Union Station every 10 minutes, starting 90 minutes before game time through the third inning for all home games. Your Dodger ticket is good on game day for a free ride on the Dodger Stadium Express*; otherwise, regular Metro fares apply. You’ll be dropped off inside Dodger Stadium behind Center Field. Return service will be available after the game. Return service on the Dodger Stadium Express runs until 45 minutes after the final out. * Same-day Dodger tickets are good for fare on the Dodger Stadium Express only. Regular fares apply on all other connecting bus and rail service. Tickets can only be purchased on the day of the game only at Metrolink ticket vending machines by selecting “Special Ticket Options”. No advanced ticket sales are available. What happens if the game ends up going 19 innings and you only want to stay for 9 innings? Are you stuck there for hours?